2. Enter the member's details for one of the relevant fields into the search field. Fields that can be used include: Surname, Address, Email Address, Member Number, Competition Number and Custom Numbers 1, 2 and 3. 3. 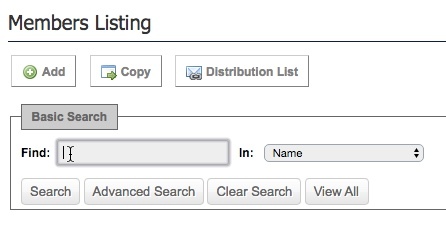 Click Search and you'll be shown any members that match your search criteria. Fields that can be used include: First Name, Surname, Address Fields, Date of Birth, Gender, Primary Member, Member Type, Subscription Type and Financial End Date. You can also copy a member record by clicking on the Copy button next to the Add button. You can then search for the member and click on the member icon which will ask if you would like to copy the member record, once you have copied the member you can edit the record with the appropriate details. The Copy function allows you to make an exact replica of a member record in your database. This function creates a copy of profile/personal details information such as address, phone number, email. It does not copy across transaction history.